With the autumnal equinox this weekend, it’s time to officially pack away the sandals and reunite with all your boots. 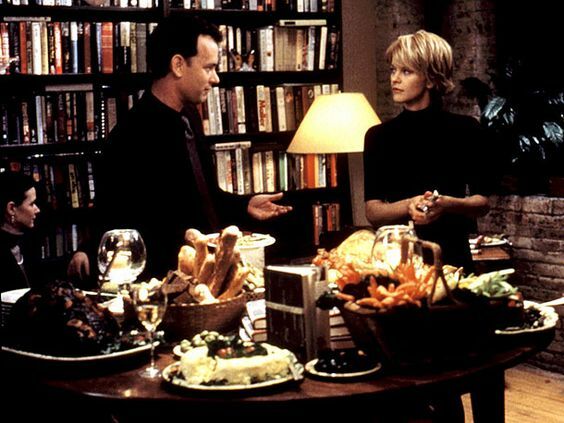 And if you’re at my place, we’ll be making french onion soup and watching You’ve Got Mail for the zillionth time (fall candles included, of course). I love seasonal rituals - especially when the weather’s cooling down - and when I pull out my fall wardrobe each year, these are the things I’m most excited to see. Throughout the season I mix in plenty of colors and prints and accessories, but these ten pieces are the basics I’ll wear again and again. A simple, lightweight sweater is pretty much the t-shirt of my fall wardrobe. It’s light enough to wear alone on warmer days or layer under a leather jacket when it’s finally cool. Bonus points if you opt for a mockneck version to channel Kathleen Kelly. For cozy weekends and colder days, only the chunkiest of white sweaters will do. Okay, I wear these all year round - but there’s something particularly autumnal about a navy striped shirt, and it really does go with everything. To avoid looking like you’ve fallen out of an ‘outfit inspiration’ Pinterest board circa 2014, pair this with at least one non-basic item. It’s finallllllly jacket season! I wear a classic trench or a black leather jacket whenever it’s cool enough outside - they’re pretty interchangeable in my book, but if I could only have one I would choose the leather jacket. Sweater dresses don’t get enough credit. All the coziness of your favorite knit, no pants required, and they’re appropriate for pretty much anything. Work? Thanksgiving dinner? Weekend brunch? Apple picking? Yes, a sweater dress deserves a spot in your closet. A couple years ago, I bought a pleated faux-leather skirt, thinking it would be a ‘fun’ thing that I would wear occasionally. Today, it’s one of my most-worn items from September through March, and my only regret is not buying a navy version, too! I’m generally not a big fan of wearing pants, but I make an exception for (1) my cashmere sweatpants, (2) green velvet trousers, and (3) a good pair of jeans. Denim that’s comfortable and well-fitted is worth the hunt. Fall temperatures often hit the point of being cool enough that open-toed shoes seem silly, but warm enough that boots are overkill. Enter: fun flats. I wear these kitty loafers and a pair of polka-dot d’orsay flats on repeat - and this bow-adorned Tory Burch pair is at the top of my wardrobe wish list. Is it too weird to call these the t-shirt of the feet? After 5 years of wear, my trusty black ankle boots are officially worn out and I think I’ll replace them with these. Last year I added a white pair to my closet and have been wearing them fall, winter, and spring - with some protective spray, they’re almost as low-maintenance as black. 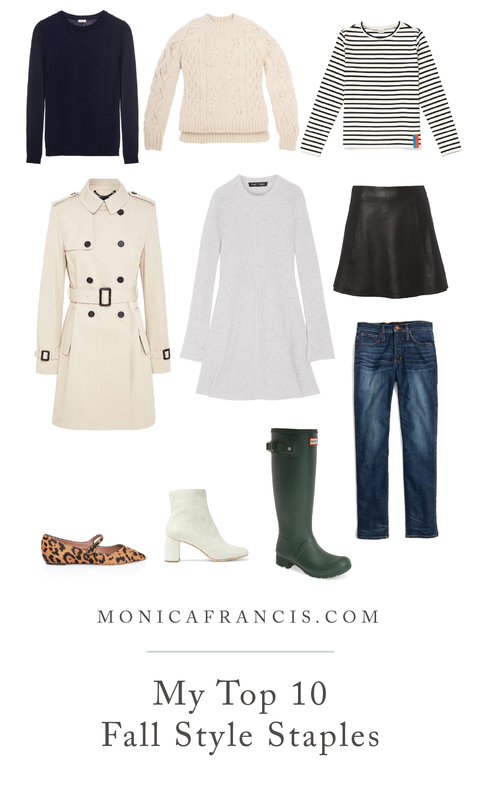 What else are you going to wear for sloshing through rain and jumping in piles of wet leaves? I love these chelsea-style rain boots for traveling, and this lace-up pair that looks warm enough to see you into winter.